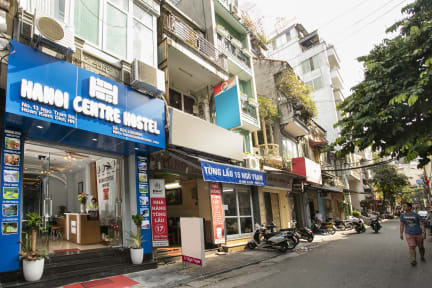 Set in the Hanoi's Old Quarter Area, Hanoi Centre Hostel offers accommodation in Hoan Kiem District, 400 m from St. Joseph Cathedral. Guests can enjoy a meal at the on-site restaurant, followed with a drink at the bar. Free WiF access and private parking is available. All rooms come air-conditioned and are fitted with a wardrobe and personal safe. Certain rooms have a seating area where you can relax, or terrace/balcony. Every room has a private bathroom, equipped with shower facility and a hairdryer. Extras include slippers and free toiletries. Hoan Kiem Lake is 700 m from Hanoi Centre Hostel, while Vietnam Fine Arts Museum is 1 km from the property. Noi Bai International Airport is 21 km away. - FREE BEER from 18hpm until finish a Keg. - Airport Pick up service. Lovely clean hostel with amazingly comfy beds! Great staff (especially Jack ) who helped us with our bus to the next place, and very helpful overall! Great breakfast with plenty of options and good location. Would happily come back again to both centre Hanoi hostel and amazing Hanoi hostel!! Ended up staying at Amazing Hostel, across the street and owned them as well. This place is Amazing, and free beer! The fact they have free beer for 1.5h every day is already a reason to stay here. Comfortable beds, great facilities and complimentary pineapple, passion fruit and watermelon for your breakfast on top what you ordered... That's just amazing! One of the best hostels I've ever been. We only stayed one night as we were flying out the next day, but I enjoyed it. The staff were very friendly and helped arrange a ride to the airport in the morning and even gave us a take away breakfast for the ride! They also have free beer at happy hour which is great way to meet other people, the location of the hostile is great as well, very close to everything! Nice hostel! The rooms are very small but its comfortable and cozy. Staff is nice, nice breakfast. Would come again!